They were men. They crept upon their hands and knees. They used their hands only, dragging their legs. They used their knees only, their arms hanging idle at their sides. They strove to rise to their feet, but fell prone in the attempt. They did nothing naturally, and nothing alike, save only to advance foot by foot in the same direction. Singly, in pairs and in little groups, they came on through the gloom, some halting now and again while others crept slowly past them, then resuming their movement. They came by dozens and by hundreds; as far on either hand as one could see in the deepening gloom they extended and the black wood behind them appeared to be inexhaustible. The very ground seemed in motion toward the creek. Occasionally one who had paused did not again go on, but lay motionless. He was dead. Some, pausing, made strange gestures with their hands, erected their arms and lowered them again, clasped their heads; spread their palms upward, as men are sometimes seen to do in public prayer. 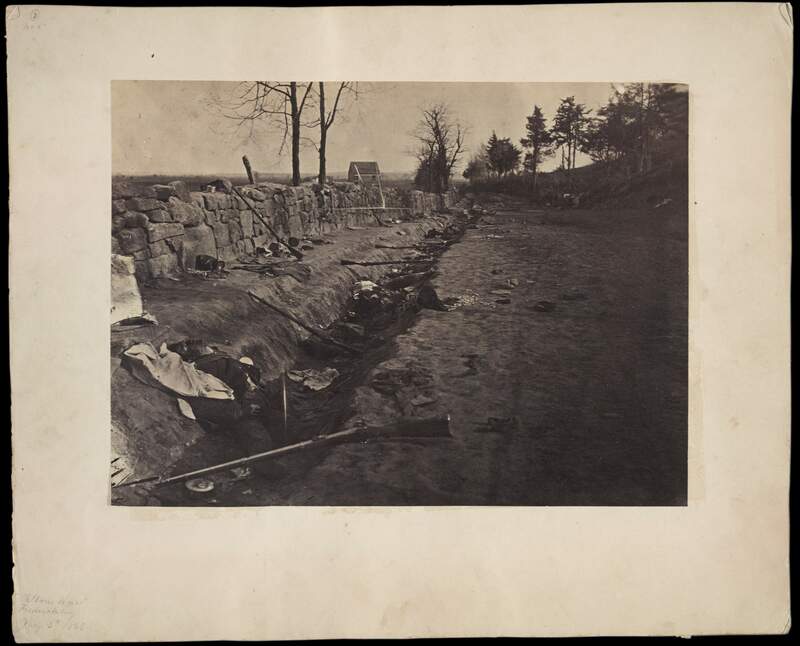 Behind Stone Wall, Marye’s Heights, Fredericksburg, Virginia, May 3, 1863. While I was looking at War is Beautiful I couldn’t help but think about the iconic, well-known photos from Vietnam or World War 2. Those images are the beginning of what has become the cinematic language of war photography. They’re what the movies reference and are part of our common understanding of what war photography is supposed to look like. Instead of looking at those images though, I got Jennifer Watts’s A Strange and Fearful Interest off the shelf and decided to look at Civil War photographs. 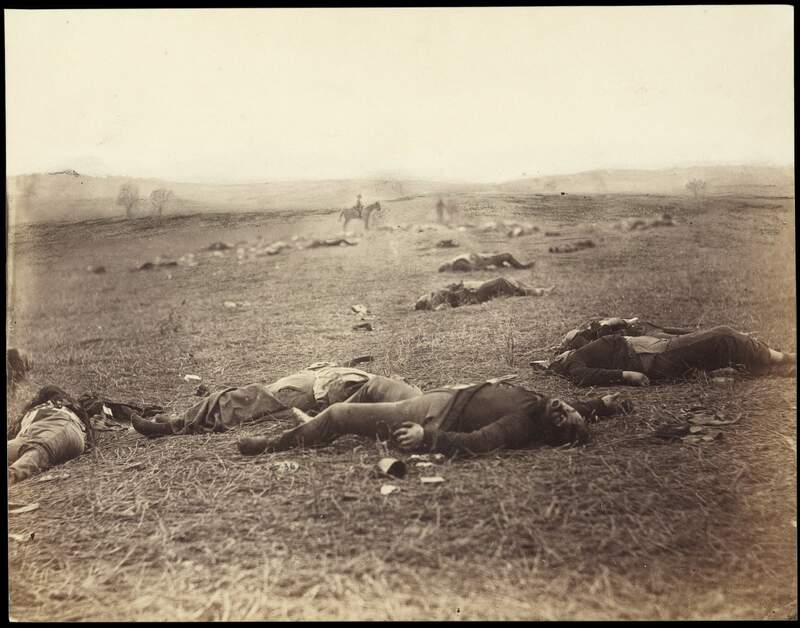 Looking at the Civil War photography shows the beginnings of our current visual culture. We can see the beginnings of personal image sharing as well as the ability for images of “real life” to become larger than life. At the same time, we’re seeing other directions or standards that could’ve been taken. 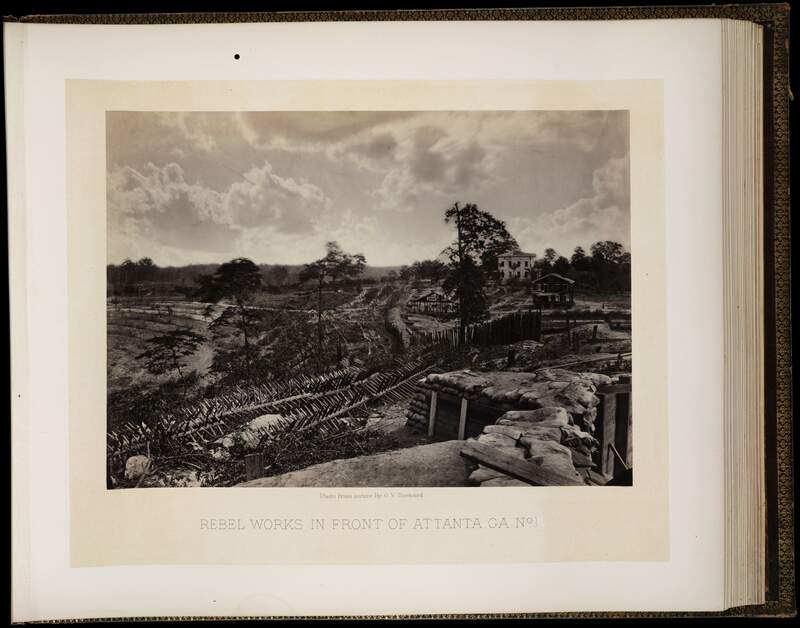 The Civil War reflects photography’s first big maturation in terms of both how we understand what we’re looking at and in terms of figuring out what practices actually work for documenting and disseminating images. There were no set rules or perspectives to copy, the field photographers had to figure things out on their own. Nor were there guidelines about what’s ethically acceptable with regards to subject matter or staging a scene. The photos of dead soldiers*—and the way those bodies were often moved by the photographers—are so wrong in terms of the current rules of photography. *Specifically noted in the book with the Antietam photos but applicable to Gettysburg and many other battlefields too. Where the Vietnam and World War 2 images are still familiar to us, the Civil War photographs are more abstract. Their look—the staging, motion blur, toning, edge effects, etc.—reads as romance and nostalgia rather than documentation. They don’t look real to us anymore even though their existence fundamentally changed our understanding of both warfare and death. But the photos themselves did say a lot about the war and the nature of violent death which, while people obviously knew,* were not images which were disseminated. There’s something about seeing the images of the bodies in the battlefields which drives home the cost of it all. 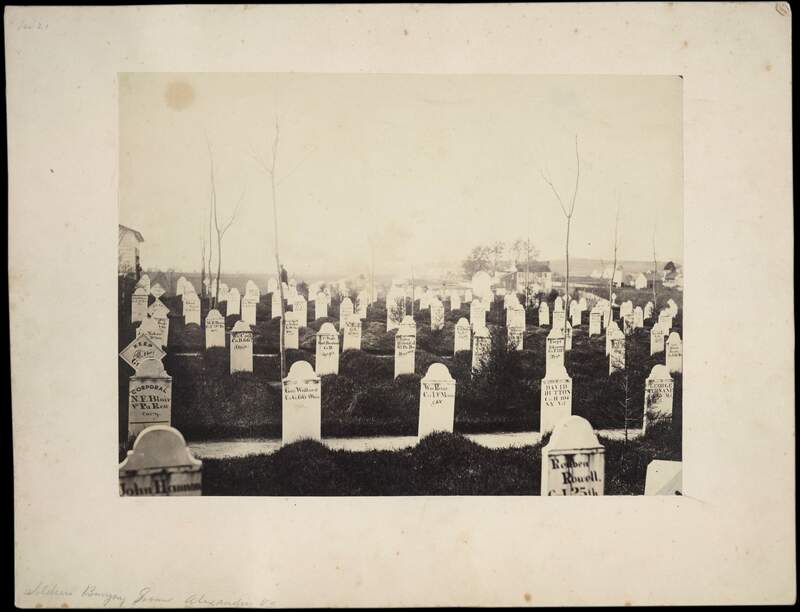 And it doesn’t surprise me at all that we created National Cemeteries as a response to the Civil War. Our collective sense of war and its outcomes changed during the Civil War—in large part due to having a new medium with which to share and remember these things. *Warfare, and in particular the Civil War, being something which touched a much larger percentage of the population then than it does now. Scrapbook 2, page 2 – Photographs by J.D. 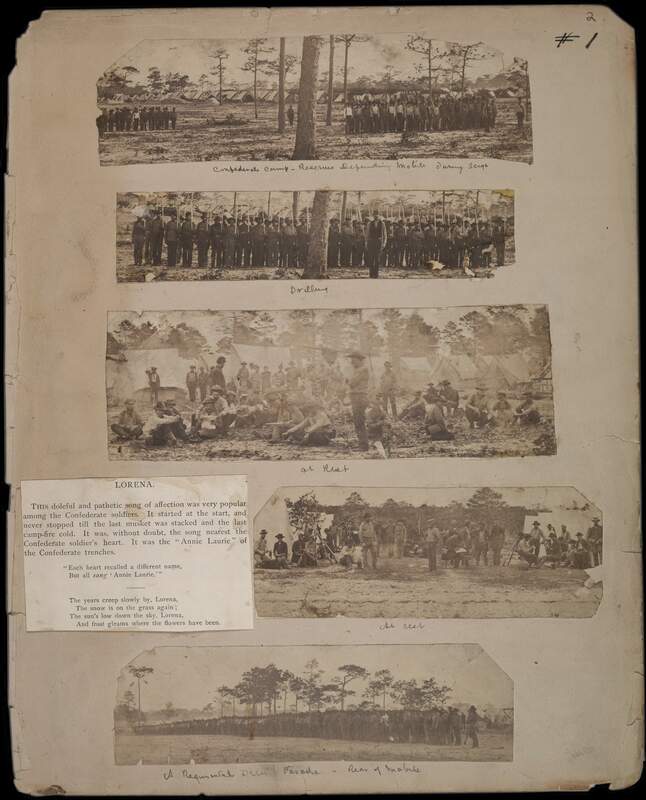 Edwards depicting Confederate soldiers drilling and at rest near Pensacola, Florida, and environs, c. 1861. It was not just images of war which were suddenly being disseminated across the US. Tintypes and ambrotypes allowed for soldiers to both send images back home and keep images of home with them on the front. While still very much a portrait/sitter arrangement, this was a much more democratic* product in how it opened up the ability for this kind of personal connection to many more people. *Reminding me of the creation vs consumption debate a few years ago. While I still agree that the Brownie opened up the true democratic floodgates, tintypes, ambrotypes, and cartes de visite did create a massive change in how we treated and understood images too. Since Confederate photographers all but disappeared after—if not during—the war, J.D. Edwards is the only Confederate photographer featured in the book. This explicitly calls attention to how our visual understanding of the Civil War is almost exclusively the Union point of view. And as much as I hadn’t realized this before, it reminded me how most of my conception of war photography is aligned with the point of view of the US or the west. I really like George N. Barnard’s landscapes of Sherman in Georgia. Barnard kept taking landscape photographs—very much in the style of O’Sullivan or Watkins—where the view is what’s important. In Barnard’s case though, rather than the promise of taming unspoiled nature, we see the architecture and landscapes of war. The book also goes into the Lincoln assassination and how Alexander Gardner’s mugshots—well, proto-mugshots since the mugshot hadn’t been invented yet—as well as his photographs of the hangings get right at the intimate relationship that photography has with death. And then there’s his Lewis Powell image which, among all the retro-nostalgic photographs in the book, leaps off the page as being, still, strikingly modern.